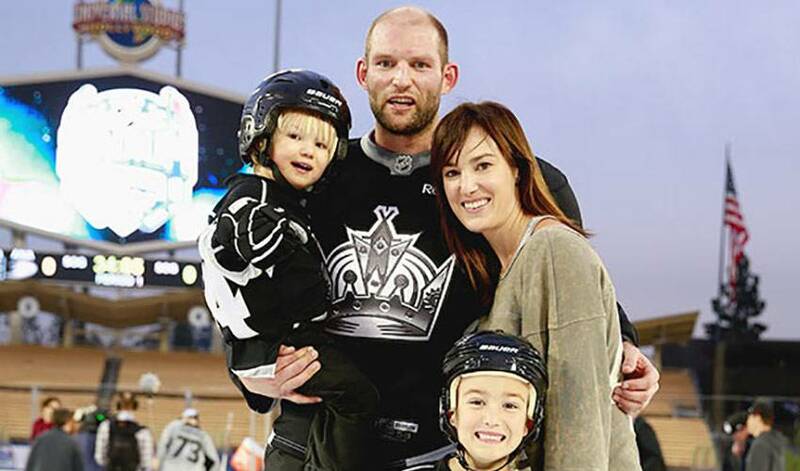 He’s persevered through plenty, but for Robyn Regehr, who recently played in his 1,000th NHL game, one thing has never wavered: his love of hockey. When he skated onto the ice on February 1, a home game against the Philadelphia Flyers, it was undoubtedly one of the most memorable moments in a long and prosperous career for one of the sport’s most resilient and respected competitors. Regehr had plenty of family and friends in the stands, almost 40 people, to help celebrate the occasion. While playing 1,000 games isn’t an uncommon feat in NHL circles, it’s a remarkable milestone for a player whose hockey career almost ended prematurely. A horrific car crash when he was just 19 left Regehr with two broken legs and a big question mark about an NHL future. Yet, even during the most trying time in his life, Regehr was thinking about everyone else but himself. As friends and well-wishers arrived at the hospital to offer their support, the rugged defenceman sported a surprisingly upbeat demeanor, equally, if not more concerned with how others were handling the ordeal. Elmer Enns, a Saskatchewan farmer Regehr has lent a helping hand to for 20 years, was at a loss for words when he heard his friend speak. So too, can his teammates. For as long as he's been playing the game, Regehr, who put in long, grueling hours of rehabilitation to heal his injuries, has always put an emphasis on unselfishness, on and off the ice. Whether it's the Brazilian-born, Saskatchewan-raised player's work alongside Enns, or his efforts within the community, Regehr, drafted 19th overall in 1998 by Colorado, has been a tireless worker who expects nothing in return for his efforts. Pounding the opposition with big hits, opening sightlines for his goaltenders by extracting rivals from in front of the net, Regehr has done it all with a humble approach. Enns, for one, is hardly surprised to see him competing against the elite players in the game. When the former WHL First Team All-Star first came to Enns' farm, it didn't take long for the latter to realize the type of work ethic Regehr brought to the fields. Although the hours were long and the work often demanding, Robyn relished the opportunity to work under a hot sun, sometimes putting in 14-hour days to ensure the job was done. The rewards? More than you might expect. The former Kamloops Blazers blueliner has also worked hard to carve out a solid NHL career, something he is deeply grateful for. Does he see any similarities between life on the farm and life on the rink? It’s what Robyn Regehr has done for 1,000 games and counting.